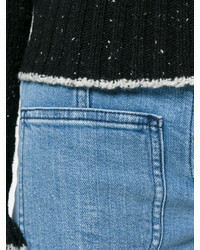 If you're in search of a casual yet totally chic look, make a black coat and Chloé flared jeans your outfit choice. Both items are totally comfy and will look fabulous paired together. 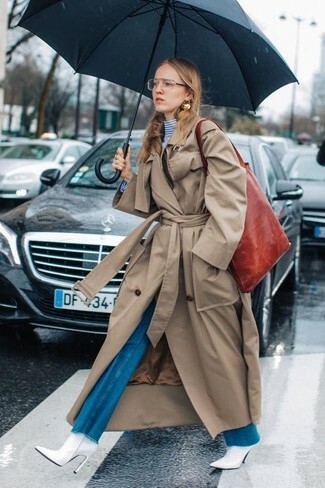 If you're scouting for a casual yet totally chic look, consider teaming a tan trenchcoat with blue flare jeans. Both garments are totally comfy and will look fabulous paired together. When it comes to shoes, this look pairs perfectly with white leather ankle boots. If you're on a mission for a casual yet absolutely chic look, reach for a grey poncho and Chloé flared jeans. Both items are totally comfy and will look fabulous paired together. Dress up this ensemble with beige leather ankle boots. If you're on the hunt for a casual yet totally stylish look, team a grey check double breasted blazer with Chloé flared jeans. Both pieces are totally comfy and will look fabulous together. Kick up the cool of your ensemble by wearing pink leather heeled sandals. 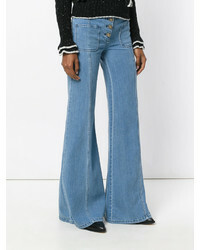 If you're hunting for a casual yet totally chic outfit, marry a blue denim biker jacket with Chloé flared jeans from farfetch.com. Both pieces are totally comfy and will look fabulous paired together. Kick up the cool of your outfit by wearing tan suede ankle boots. For a cool-meets-totally chic outfit, pair a grey fur coat with Chloé flared jeans — these items work perfectly well together. 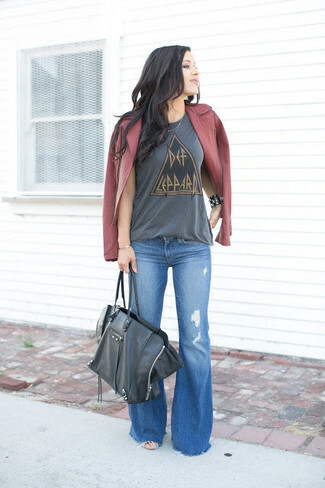 If you're scouting for a casual yet chic getup, consider pairing a burgundy leather biker jacket with Chloé flared jeans. Both pieces are totally comfy and will look fabulous paired together. 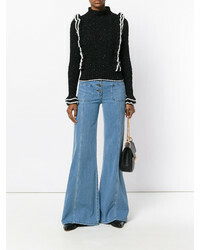 If you're searching for a casual yet chic outfit, team a black coat with Chloé flared jeans from farfetch.com. Both garments are totally comfy and will look fabulous together. As for the shoes, grab a pair of purple suede ankle boots. If you're on a mission for a casual yet stylish look, opt for a tan leather biker jacket and Chloé flared jeans. Both items are totally comfy and will look fabulous together. When it comes to shoes, this getup pairs wonderfully with dark brown leather wedge sandals.